both of circular convex form with a band of repousse decoration of flowers and foliage and similar design to the rims, each with leaf handles and standing on four pedestal shell and leaf feet, both with gilded interiors. There is a matching animal to one cartouche on each. 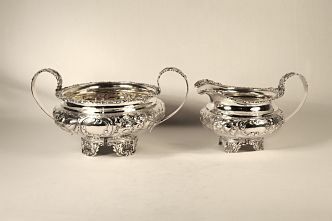 The sugar bowl is by Thomas Wilkes Barker, London 1824 and weighs 14.1 ounces or 400 grams and measures 200 x 140 x 105 mm high (7.9 x 5.5 x 4.1 inches). The detail below is for the cream jug. 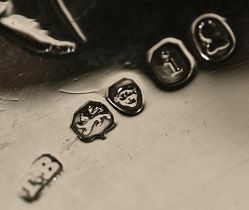 The total weight of silver is 22.8 ounces or 647 grams.